It gives me great pleasure to welcome you as you start your journey here at the University of Hertfordshire. The University is here to support you, from your first days as a student right through to graduation, to ensure you get the most out of your time here. As students, you are at the heart of our academic community. We encourage you to learn from each other and the variety of perspectives represented in our diverse community. You will have endless opportunities to learn, explore, meet new people, gain valuable life skills and, obviously, to have fun! We are here to support you along this exciting journey of development and discovery, and hope you look forward to the great times ahead. Meet Anis... Tell us a little bit about yourself Anis: I’m a Law graduate from UH, currently working as the President Community. I am a debater, a model UN goer and an amateur guitarist! I’m an optimistic person, and I love travelling, cycling and running. What do you love the most about HertsSU? Anis: I love the way everyone communicates in the SU; If you need something, just give us a shout and we’ll always do our best to help you out – everyone is here to help. I am looking forward to representing the underrepresented groups of students and building that sense of community across the University. What’s your ideal way to spend the weekend? Anis: Being with my friends in Santorini, Greece. Going scuba diving, trying new food, unreal scenarios, what else can I ask for! Meet Zaina... Tell us a little bit about yourself Zaina: I’m Zaina, President Education. I started the role as a Literature Masters student and have a Literature degree from UH. What do you love the most about the Students’ Union? What small thing makes your day better? Zaina: The fact our doors are huge and always wide open for anyone to come in and have a chat about anything they need our help with. Zaina: A caramel frappé from one of our on-campus Starbucks outlets. Zaina: Immortality Field Resort from Rick and Morty, and I would take with me all the UH Rick and Morty fans with me so we can chill. Amal: I’ve completed my second year in Law and have taken a sabbatical year to run as an officer. An interesting fact about me is that I served as a Naval Officer for the Indian Navy. What is it? Itâ&#x20AC;&#x2122;s not just a slogan on the back of your new hoodie! Go Herts captures our community spirit, both on and off campus and around the world, while celebrating our success. What success does Go Herts celebrate? All of our achievements! From the amazing sporting victories of our Athletic Union, to the groundbreaking discoveries made by our researchers, not to mention the outstanding achievements of our enterprising students, alumni and staff. How can I get involved? Got something great to shout about? Use #GoHerts in your social posts and make sure you tag us so we can share your achievements and positive moments. And wear your hoodie with pride! Keep it safe If you lose your ID card you’ll need to pay to get a new one, so look after it! New cards can be obtained from the Student Centre located in the Hutton Hub on the College Lane campus. Update us Keeping your contact details up-to-date is vital to getting the best experience possible. It is your responsibility to make sure they are correct, so just log on to your student record to make any changes. Remember Your attendance at teaching sessions is crucial to ensure you make the most out of your time here. Remember to tap your ID card on any of the ‘Check In’ points around campus each day so we know you’re around. The best students tend to be the ones who have the best attendance. •	And your student ID card This ID card is essential for life on campus and you should carry it with you at all times. It will give you access to all the buildings and facilities you’ll need, especially the Learning Resource Centres (LRCs). Plus you’ll need to ‘check in’ each day at one of the points across the campuses, just by swiping your card. If your name changes then go and see the Student Centre team in the Hutton Hub, College Lane. It’s worth remembering that the name we have registered for you is the one that appears on your degree certificate once you graduate, and we can’t change it once it’s issued! What to expect… You’ve registered, you’ve got your hoodie… what next? SU Officer Anis has got an insight into what you might expect in your first few months here at Hertfordshire. 1. Fun The first month of Uni is the best month! You don’t have that much work yet so you will be able to make the most of all that’s on offer – from society events to trips away to sports matches. You will make some great memories that you will look back on when you finish Uni and wish you could do it all again! 2. Socialising All Freshers are new to the University, so expect lots of other new people to say hi! You will more than likely be asked for your phone number loads of times and be added into hundreds of WhatsApp groups – but that is a good thing! You might also get invited to different peoples’ flats for dinner or a coffee or to meet their house mates – take up these opportunities as it will help you feel part of the University community. 3. Nights out There will be plenty of nights out for everyone to enjoy including Forum Club nights, EleHouse karaoke nights or society led events. There is always an excuse to go out and socialise and start to make new friends. 4. Freebies Who doesn’t like a freebie?! During Freshers’ Week you will receive a Freshers’ bag with lots of interesting goodies, your new School might have some fun freebies to help you with your course, and – of course – you can grab your free Go Herts hoodie at registration: AMAZING! 5. Advice There will be loads of flyers handed to you about where to receive free, impartial advice: trust me, these flyers are important. At some stage during your time here you’ll be after some sort of advice – whether that’s money, housing, or general wellbeing advice. There is plenty of help around (see page 41) especially during your first few months. 6. Freshers’ Flu Yep, Freshers’ Flu is real and definitely not a myth. People often get cold-like symptoms during the first month of University because they are usually a bit run-down from all the Freshers’ partying, and also because of the large number of new students arriving onto campus! Try to get enough sleep and eat as healthily as you can. Do not try and survive on pizza while staying up ‘til 4am every night! And it’s probably a good idea to invest in some anti-bacterial hand gel. 7. Noise The first month at University is very noisy. Everybody is busy getting to know each other, there are lots of Freshers’ events that involve live music, flat parties, people staying up late at night and different activities happening across both campuses. Don’t worry if you prefer a bit of peace though – it will soon quieten down once everyone starts to hit the books. Remember – most people come to University not knowing anyone else but keen to make friends – don’t be afraid to strike up a conversation with someone new to make a new friend! University must-haves Whether youâ&#x20AC;&#x2122;re living on campus or commuting in, here are SU Officer Zainaâ&#x20AC;&#x2122;s top five items to help you ace your First Year. 1. USB stick It is always handy to carry a USB stick with you at University so you can save all your work in one safe place. It also means you can use the LRC (Learning Resources Centre) computers as well as a laptop, so you can study in different areas across the University. You can also take advantage of free access to Office 365 and save your work in the cloud!. 3. Water bottle Staying hydrated can really help your wellbeing and concentration levels. Save money on buying bottled water every day and invest in a reusable water bottle that you can fill up at the beginning of the day and top up throughout the day. You can find water coolers across both campuses in our food outlets and the LRCs. 2. Medicine University can sometimes be stressful so you might find yourself feeling run-down. Having paracetamol, flu tablets or even some multivitamins on hand is useful in case you start to feel ill but have a few deadlines coming up. The Campus Pharmacy in Hutton Hub is a great place to stock up and also get advice on staying healthy. 4. Portable charger During term times you will be a busy bee, going from lectures, to studying, to taking part in activities, to going out at night – so keeping your phone charged is a good idea! Invest in a portable charger and I promise you won’t regret it! And if you’re living in shared accommodation… 5. C  oloured plates/ cutlery Most people will bring white plates and silver cutlery to their shared accommodation, so nobody knows whose stuff is whose! By having coloured plates, you can easily see what belongs to you. Genius! Getting settled Starting university can be exciting and nerve-wracking in equal measure. SU Officer Amal has a few suggestions to help you feel at home. most importantly, where to buy a decent coffee! Spend some time walking around – not only is it good to get out and about but you will start to recognising places and get used to your new surroundings. 3. Get involved The worst thing you could do if you’ve just moved into halls is sit in your bedroom alone. Get involved in as much as you can: •	Attending the Freshers’ Week events is essential. Not only will you have loads of fun but you will meet different people and build relationships with course mates or house mates. •	Try something different: join a society or sports team or attend an Active Students session – chances are you’ll meet loads of likeminded people. 4. Have fun This will be one of the most exciting times in your life so remember to reflect and take it all in. Enjoy yourself as much as you can before all the deadlines and hard work starts! And even then, try and get a good balance of working hard and relaxing. 5. Snap-happy Take as many pictures as possible as you will make some incredible memories! Remember you are at the University of Hertfordshire because you have the potential to do anything and become anyone, so don’t hold back – get stuck in! Top tip: Download the wayfinding app to help you get around. Search ‘Herts Mobile’ in your app store. What is it? Well it doesn’t involve carousel rides or candy floss, but it is an amazing opportunity for you to find out about the best of what our University has to offer! All our clubs and societies have stands with their members on hand to tell you all about how brilliant their club is. Film and TV student, Jono, has experienced Freshers’ Fair as both a First Year student and as a society committee member, so here are his top tips for making the most out of it. •	Make sure you give yourself enough time to look round the fair There is a lot to see and I’ve found myself rushing round trying to see everything before it finishes! So get there near the start and take your time taking it all in. •	Don’t be shy Dive in and sign up to your favourite societies, if you leave it til later you might never do it. Uni is the perfect time to try out anything and everything so don’t hold back, you don’t know what you might miss out on! •	Grab a Freshers’ bag containing lots of cool freebies! •	Get yourself a TOTUM card The National Union of Students (NUS) new TOTUM card gets you access to loads of discounts – like money off meals in Pizza Express, reduced theme park entry, discounts with retailers like ASOS… Personally I think it’s well worth the investment! •	Visit as many stands as you can You will find yourself being bombarded with freebies during the fair (which isn’t a bad thing), so make the most of it! •	Bring cash There is also stuff to buy (like yummy street food) so make sure to bring some cash with you (I usually limit myself to £20 as this is plenty). Go Herts Award To help our students stand out from the crowd, the University, in partnership with the Studentsâ&#x20AC;&#x2122; Union, have launched the Go Herts Awards. This exciting new initiative celebrates all of the outstanding work our students do outside of their studies, whether that is voluntary work, research, enterprise initiatives, community engagement or work experience. Students who achieve this award will receive an official University certificate, as well as recognition at their graduation ceremonies. It’s no secret that the job market is getting ever-more competitive, so how can you make sure that when graduation rolls around in a few years’ time your CV is the one that stands out on that recruiter’s desk? “The first society I joined when I started University was the Hindu Society. It was a good way for me to meet other students who had the same beliefs as me and a great way to make new friends. Can’t find a society that floats your boat, then why not set up your own? All you need are another couple of likeminded people to help you run it, then just email societies@hertfordshire.su and we’ll arrange an induction where you’ll be trained in running your new society. Just imagine how impressive that’s going to look on your CV! Entrepreneurial attitude: check. People skills: check. Leadership potential: check! Find out more about the different societies at our Freshers’ Fair – 11.00-15.00 on Friday 21 September on College Lane. You can meet some of their members and find out what life could be like as part of the Baking society, the Street Dance society or the LGBT+ society. Check out page 19 for top tips on getting the most out of Freshers’ Fair. If you miss out on the Freshers’ Fair (tut tut!) 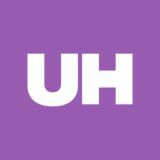 check out hertfordshire.su to search through all the societies and pay your subscription. University can change your life, but you can also change other people’s while you’re here. Our Students’ Union run a volunteering programme that allows you to apply for one of the hundreds of opportunities based in the local community and log any hours worked on their portal. Giving something back can be immensely rewarding, and it doesn’t hurt that employers love to see voluntary work on your CV too! Connect Common Reading Programme The Connect Programme is a University-wide reading programme focused on First Year students. Students and staff read the same book and participate in discussions, activities and events that relate to the themes of the book. More than ‘just a book club’, Connect provides unique opportunities to engage with a book more deeply than simply reading it. Every School is involved, offering activities linked to the themes of the chosen book for the year, as it draws people together from a wide range of backgrounds. This year’s book is Ghost Boy by University of Hertfordshire alumnus Martin Pistorius. It’s an inspiring true story of a ‘misdiagnosed boy trapped inside his own body for 12 years’. If you didn’t collect your FREE copy of Ghost Boy at registration then head to the Freshers’ Fair to pick one up. There is a great big world out there and the University of Hertfordshire will help you explore it. Most of our courses allow you to spend part of your degree studying at one of our many partner institutions across the world. Did you know? Wherever you choose to study you pay no tuition fees to the partner university, and, if you study abroad during a placement (sandwich/intercalated) year, then there are no tuition fees to UH either. Get support and advice from our Careers Service team to help you bag that perfect placement. Drop into our offices in Hutton Hub, College Lane, or M018 de Havilland, or visit careerhub.herts.ac.uk. Fancy yourself as the next captain of the football team, or looking for a way to meet people and get active? Weâ&#x20AC;&#x2122;ve got all the options you need. HertSquad HertSquad is your hub for sport and active lifestyles during your time here. Itâ&#x20AC;&#x2122;s a great way to meet like-minded people, have fun and enhance your time at the University. Staying active is proven to aid you on your degree journey by making you happier, healthier and increasing brain activity. We really believe that taking part in physical activity can enhance your student experience. We want to nourish your existing passions and encourage you to try something completely new through our various programmes. Check out uhsport.co.uk for more information. “I have been an ‘Activator’ for two years, which meant attending the activity sessions to help ensure the session runs smoothly, making sure it’s The Active Students a safe place to exercise, and Programme is totally FREE most of all that the students and offers over 70 hours of activity across both campuses all mingle and have fun! every week. There is no need Sport doesn't have to be competitive. HertSquad Active Students is all about having fun, getting active, giving something a go, making new friends and taking a break from studying. to sign-up, just bring your Student ID down to a session and get involved – it's really that simple. It’s a great way to meet new people, create friendships that will last a lifetime and make the most of your experience whilst studying at the University. Check out www.activestudents.co.uk for our timetable of sessions. On the de Havilland campus you’ll find the Hertfordshire Sports Village (HSV), which offers some of the best sporting facilities available in the UK. That’s why it’s used by a number of professional teams as a training base. You’ll probably have passed in on your way to registration, so don’t miss the chance to pop in and check out the facilities. Over on College Lane, the Oval is home to a stateof-the-art 50-station gym, available for use exclusively by University of Hertfordshire students and staff. It’s located in the heart of the student accommodation area and is open 24 hours a day. From just £15.25 you can have access to two gyms, a swimming pool, 90 classes – and its all on campus! Whether it’s because you live in halls, study there or spend most of your time on a particular campus, during your time at University, you will associate with either College Lane or de Havilland campus. Where will your favourite place be? The de Havilland (de Hav) and College Lane campuses have different vibes, but both offer ample opportunities and resources for all our students – regardless of whether you live on campus or commute in. Restaurants and shops There are restaurants and shops on both campuses. So, if you haven’t had time to make breakfast to attend that 9am lecture, pop into these outlets to grab yourself a hot bite to eat or other necessities throughout the day. Common rooms Both College Lane campus and de Havilland campus have common rooms with pool tables, foosball and board games. Unwind after a hectic day and grab your friends to play games and even order a pizza in! Learning Resources Centres (LRCs) Our LRCs are more than just libraries – they become a second home for most of our students! College Lane LRC has been recently refurbished as well, bringing you better spaces to collaborate and study quietly. LRCs are open 24/7 which means the odd all-nighter is more convenient and meeting deadlines is easier. Read more about the facilities and services available on page 59. Bars and entertainment College Lane has the EleHouse and de Hav has Club deHav, so if you want to make full use of the no-lecture Wednesday afternoons you won’t have to go too far from your rooms. The oncampus nightclub, The Forum Hertfordshire, on College Lane campus also has regular nights out. Other services The University has ensured that everything that you may need as a student is easily accessible to you. So you have access to Santander Bank, the pharmacy (for Freshers’ Flu) and a doctors surgery for any medical needs all available in the Hutton Hub, as well as laundry services in each hall to keep your stuff fresh. 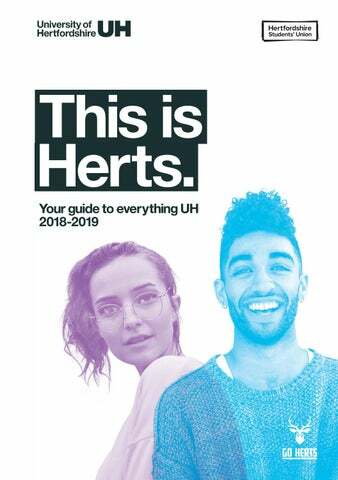 Finally the University of Hertfordshire also boasts amazing mental health services such as counselling and drop ins for consultation and advice for those times when you may feel a little low (read more on page 40). Bring it on Battle of the Campuses is your chance to represent your campus in a series of events, games and competitions throughout the academic year. Whichever campus wins the most points by the end of the year is crowned the ultimate Battle of the Campuses champion. Chicken nugget challenge “My favourite memory of Battle of the Campuses was watching people compete in the ‘How many chicken nuggets can you eat in a minute’ challenge, which was entertaining to say the least. I was supporting #TeamDeHavilland since that’s where I studied and lived throughout my three years of University. Feeling part of the campus community whilst at University is so important to allow you to make the most out of your University experience, and Battle of the Campuses is a great way for you to feel included whether you live on or off campus. You get to meet new friends, join in fun competitions – like tug of war or food challenges – get to know the campus better, make lasting memories and of course, get into the Go Herts spirit. When you watch Roger Federer powering his way to victory on Centre Court – or any other superstar – it’s easy to think that they’ve made it all by themselves. But behind Roger is a whole team of professionals making sure he has the best chance of winning – physiotherapists, dieticians, coach, playing partner, personal trainer - and that’s before you come to the people managing his image off court. It’s the same with university. Your degree and your marks belong to you. But there are a whole team of people available to help you, from your module tutor who teaches you – and can give you extra guidance if you ask – to the Student Wellbeing team and the Students’ Union. Mental health support “Starting university can be a daunting time, with a new place, new classmates and new teachers, so it is understandable that mental health issues are increasingly common among students but there is still a stigma surrounding mental health issues. It’s really important to talk to someone if you are worried about your own mental health (or that of a friend’s) as soon as possible. The sooner you get support the better, as things will only get worse if you bottle things up. Also, look after your friends. If they don’t seem themselves and you think they may be struggling, ask them how they are and let them know you are there for them, and will listen without judgement. University is a great opportunity to assert your independence and find your own way in the world. But that’s not to say that you’re on your own. Whether you’re feeling homesick, having a hard time balancing your finances, or just need someone to talk to, we’ve got your back. We are spoilt for food choices on campus. Breakfast, lunch, dinner, midnight snacks? Sorted. Eating On-campus options Whether you want a full English, a vegan curry, or a healthy salad box you can head to one of our on-campus restaurants to enjoy a whole range of different foods. The SU pub, the EleHouse, does an amazing burger and chips, you can pick up a foot-long from the Subway on College Lane, or stop off at one of the coffee pods across both campuses to grab a Starbucks Frappucino and panini after a lecture. There’s a large range of hot and cold halal items, kosher bagels, and vegetarian and vegan options – whatever your preferences, you won’t go hungry. And don’t forget to look out for the pop-up street food stalls which appear on campus throughout the year. You can enjoy delicious meals cooked in front of your eyes, including, paella, burritos, bubble tea and so much more! Eating out Whatever you fancy eating, there are tonnes of restaurants and cafes in Hatfield. To help you answer the all-important question of ‘Where should we go for food?’ we’ve put together our recommendations for eating out: (Cheeky) Nandos ££ Whether you like it extra hot or with lemon and lime, Nandos is a great choice for you and your mates to catch up over an affordable and tasty meal. Located in The Galleria, it’s only a stone’s throw away from either campus, so you can make your way over in between lectures. Turkish Kitchen ££ Located next to the Wetherspoons (also a great shout), Turkish Kitchen is a good little restaurant, perfect for a social lunch or dinner with friends. The food is affordable and the flavours are amazing. They also do a fantastic lunch time deal, Mon-Fri, 11.30-16.00. Check it out. Fast Food Galore £ What would Hatfield be if it didn’t have all your favourite fast food restaurants. There’s McDonalds, KFC and Burger King, all located in and around the Galleria. McDonalds is open 24 hours, just like the LRC! So if you’re cramming late at night in the LRC, take a break and feed your mind. Red Lion £££ Great pub near Hatfield Train Station. They do Sunday roasts, lovely pub and grill food, and have a beer garden out back for the Summer months. Definitely worth a visit. FoodHertfordshire loyalty+ If you can’t do without your morning latte, or love the all-you-can-eat breakfast, then make sure you pick up your FoodHertfordshire loyalty+ card. Collect points on all your purchases from any of our on-campus outlets to earn discounts: turns out there is such a thing as a free lunch! Pick up a card at any catering outlet or download the app on Google or Apple stores – just look for UH Food! Did you know? You (or a generous family member or friend!) can load money on to your FoodHertfordshire loyalty+ card to spend at any catering outlet on campus whenever you need it! Eating well is good for the mind as well as the body, so get yourself into the kitchen and cook up a storm. Here are our top tips for eating well: 1. Stock up on flavours Bland food is never appealing, so get acquainted with the herbs and spices aisle in the supermarket for a tastier meal. Tabasco sauce and soy sauce are good staples to have in your cupboard to spice up that end-of-the-month meal. 2. Get to know your shops Aldi and Asda are both about a 10 minute walk from College Lane campus and have great quality produce at bargain prices. And if you shop with a friend you can make the most of those buy-one-get-one-free deals (and split the taxi fare back home again). 3. Plan your meals Before you hit the shops, decide what meals you’re going to make for the next week or so and make a shopping list for them. That way you’ll be sure to have what you need, and you’ll be less likely to reach for the take-away menu. 4. Batch cook Save yourself from cooking every night by cooking large portions that you can reheat the next night, or freeze for another day. Better still, take it in turns to cook with your housemates and you’ll broaden your tastebuds too! 5. Community fridge If you’ve got food you won’t eat or want to try something new, head to the community fridge in the Oval, College Lane. You can drop off unwanted food and pick up other stuff for free! Whether you’re living away from home for the first time, or you need to adjust to earning less and having to spend more, then it’s a good idea to get savvy about your finances early on. Money •	If you haven’t already done it, then take a bit of time to work out your projected income for the year (including any loans and bursaries) and your essential expenditure for the year (including accommodation, utility bills, travel costs etc.). It’ll make it easier to work out how much you’ll have left over for the ‘nice to haves’. •	Get a part-time job to boost your income (and enhance your CV). You can get help finding out what’s on offer through the University’s Careers Service and through the Students’ Union. •	There are various financial/budgeting apps available to help you keep on top of your finances. Check out some free options over the page. •	If you’re still worried about your finances then make sure you visit the Hutton Hub to see one of our Student Finance Advisors. They can help you to budget and see if you may be eligible for any extra financial support. Student Funding and Financial Support have teamed up with Blackbullion to help enhance financial education for all University of Hertfordshire students. And what’s more, it’s completely free! Just like us, Blackbullion are passionate about inspiring a finance-savvy revolution by making it easier than ever before for students to learn about money management and boost their employability through a range of easy to follow, useful training programmes and related services. How do I sign up? •	Go to www.blackbullion.com •	Click Register •	Select ‘a University Student’ from the drop down menu •	Enter the required details and begin your journey •	Select Hertfordshire as your university •	Enter your Student ID number •	You’re in! Budgeting apps One of these free apps could be a good place to start to help you stay on top of your finances: Yolt Allows you to track your finances and manage your overall spending. You can use categories to see how much you’re spending in different areas. Cleo Works through Facebook and takes a read-only (so no one can ever move money in or out of your account) look at your spending to help you keep track of your finances. Money Dashboard Categorises your spending and displays all incoming and outgoing amounts on a dashboard chart, so you can see what you spend in different areas. Pariti Connects your bank accounts: you can view what you have coming in plus set spending goals. It updates automatically each day so you can see what you’ve got left to spend. 4. Find a job near you Travelling further than you need to just to work eats into your time and could end up costing you more than you earn! Finding a local job or even working for the University is always a smart idea (see over the page). 5. Stand your ground Once you’ve got yourself a job, don’t accept rates lower than the minimum wage and make sure you get a contract. And don’t be pressured into taking on extra shifts – if you do it once, you’ll end up doing it again – and you won’t get that time back for studying. 3. Think about your future Most jobs now require work experience, but how can you get that experience without having a job? Work placements, modules that offer work experience and summer internships are just some of the ways that you can give yourself the best chance of a great job after uni and also discover whether the sort of job you think is right for you, really is. Fancy earning some extra money without having to stray too far from campus? Look no further than the University! Herts Helper Our Student Ambassador scheme is a bit like joining a temping agency – if your application is successful then you’ll be able to sign up to work at events as and when you are available, so you don’t have to worry about it getting in the way of your study commitments. Independence Whether it has been your parents ‘nagging’ at you to knuckle down, or your teachers giving you explicit instructions on material to learn, at University you won’t have the same level of direction you might be used to. You are expected to take personal responsibility for your own learning: you’ll be given all the tools you need, but it’s down to you to make the most of them. This can feel a bit overwhelming at first, but chatting to your course leader or seeking support and advice from the Students’ Union can help you adjust. And besides – it’s so much more satisfying to know that your breadth of knowledge has come from your own hard graft, rather than just passively being taught it. Time management At school or college you will probably have been used to a 8.30-15.00 timetable with plenty of compulsory lessons in between; so when you pick up your new course timetable you might be surprised at the amount of ‘free time’. However you need to make sure you use this time wisely... and we don’t mean spending all of it in the pub! You’ll be expected to do your own research and independent reading in preparation for lectures, seminars and assignments, and if your course is more practical then extra lab time will be an essential part of your week. That said, you do still need a good balance of work and play so – top tip – draw up your own timetable for the week with designated slots for both independent study and time to chill out and have fun. It’s all about getting the balance right. Teaching styles Your idea of education might be sitting in a class of around 30 others listening to teacher at the front of the class dictate what you should know. At University you could find yourself on one day in a lecture room with 100+ other students scribbling down notes, then the next in a seminar room with 10 others being encouraged to challenge what you heard in that lecture! Embrace this change and the variety of teaching methods you’ll experience, and embrace the idea of challenge too – ultimately it will stretch your learning and enhance your knowledge. your week, enabling you to manage your social life and make plans without having to cancel because of unforeseen deadlines and overwhelming amounts of work. Use the library It is best to separate your academic and social life where possible. If you study at home you run the risk of being distracted more easily. It could also mean that you eventually end up associating your home life with the tedious chore of studying. Try using the library to study instead. Not only does the library house resources that are not always available at home or online, it also acts a great place to work in quiet. Alternatively, you can go with a study-buddy, keeping each other motivated and helping one another when you need it. When you leave the library, you can leave the grind behind! It is also important to know when to take a break. Using a reading week efficiently A reading week may sound strange at first and something you may never have encountered before. But instead think of it as similar to half term at school, it’s a break from teaching to do as you see fit. Depending on when a reading week lands in the term is likely to determine how you spend it – if it’s just before a major assignment deadline then it’s fairly likely you’ll be spending a big chunk of it in the LRC (see facing page)! But if you’re not sure what the best use of your time would be then here are a few suggestions: Get ahead Take advantage of the additional time to complete upcoming assignments Plan Review your academic year and plan your time for the rest of the semester Explore Use the time to try something new – attend an Active Student class Chill If you’re on target in your studies then take a break, spend time with family and friends Each school decides if and when you will have a reading week so please check you timetable or contact your module leader. It’s very rare that you’ll ever go to the LRC and find it shut. Our LRCs offer 24/7 learning with endless resources at your disposal from over 400,000 books to borrow to over 1,200 PCs and Mac workstations to use. You can even loan out a laptop. Remember! You need to show your UH ID card to gain entry. If you ever forget or lose your ID card then you can get a one day temporary pass but you only get three of theses a semester. •	Self-service printing, photocopying and binding and laminating facilities •	Students can use the noticeboards in the cafés to advertise on Study rooms There are several study rooms that students can book across both campuses for both group work and individual study. The size of a study room can range from accommodating 1 person to 30 people. Most group rooms will have a LCD screen or projector, which you can attach a device to using the cables provided, along with a whiteboard, and table and chairs. A study room provides an isolated environment for both individual and group work. You can book up to five hours per week through StudyNet. â&#x20AC;&#x153;I relied solely on public transport which luckily the University had great links for.â&#x20AC;? With more than fifty per cent of students now commuting to University as opposed to living on campus, here at Hertfordshire we recognise how important it is to make the journey as straightforward as possible. “Since I lived quite local to the University, I decided that commuting in would be the most efficient option. In my First Year I didn’t have my driving licence so I relied solely on public transport which luckily the University had great links for. I would catch the train into Hatfield and from there either take the bus – which ran regularly and was only £1 – or walk, which took around 20 minutes. If I had to be somewhere in a rush, like to catch my train for work, I’d use one of the local taxi companies only cost me around £3.50 to travel anywhere to and from Hatfield. Over the summer after my First Year, I got my driving licence and so started to take advantage of the Park and Ride – I met many of my friends during those regular bus rides to and from the Park and Ride! Hertfordshire Festival of Music The ambitious Hertfordshire Festival of Music is a mustsee event for all those who appreciate their classical music. This more slow-paced festival lasts a week and features music being played by award-winning classical musicians all as well as a choir, orchestra, concerts and talks and masterclasses. St Albans Food and Drink Festival For all you foodies out there the St Albans Food and Drink Festival is the ideal place to go if you fancy broadening your culinary palate. This autumnal event held over a week offers appealing local produce, beer and feasts and hosts the Food and Drink Awards. You can also test your tasting skills at the CAMBRA Beer Festival or join in with the ‘Feastival’. Hertford Arts Festival This spring festival creates an exciting buzz in Hertford and kick-starts the summer season. This event is ideal for all art lovers, showcasing the incredible work of local artists across the town. You also can peruse the craft market, take a stroll along the art trail or watch a production at the Hertford Theatre. St Albans Film Festival For all devoted film fanatics, the St Albans Film festival offers an awe-inspiring event with open-air film screenings beside the St Albans cathedral, workshops, talks by film industry experts and finishes with an awards ceremony hosting the international short film competition. Folk by the Oak This one-day family-fun event is a perfect combination of a relaxing village fete and bombastic festival experience. Held in the leafy grounds of Hatfield House, Folk by the Oak promises a fantastic lineup of musicians and artists as well as lively circus performers and story tellers. There are even workshops on bush crafts folk and archery and stallholders with creative and colourful foods for you to try. Slam Dunk Slam Dunk is one of the most hyped music festivals in the region and a popular event for students at the University. Slam Dunk has been taking place in Hatfield since 2010 and offers some of the very best in punk and ska. The all-day festival gets bigger and better every year and is sure to be just at spectacular in 2019. Previously located at the University, Slam Dunk has now grown and takes place at Hatfield House. Freshers’ Week Head down to the Freshers’ Fair on Friday 21st. Check the events boards outside both our LRCs to stay up-to-date. Graduation Our December ceremonies are held on our de Havilland Campus, in the Weston Auditorium. Graduation Ceremonies for our most recent graduates are held in the St Albans Cathedral. Remember... cold and flu season will be well and truly setting in, so make sure to register with the on-campus doctors surgery. Refresh Week New year, new modules, and some new students too. Refresh Week is like Freshers’ Week all over again, just a bit colder! A week packed with events to get you back into the swing of uni life after the break, and includes another huge fair. Summer break Semester B finishes on Friday 17 May For many students that’s year one done! Exams and assignments In the first week back exams and assignments will be top of mind. It can be a stressful time, but don’t worry, we’ve got your back. Search ‘exam success’ on Ask Herts for tips and advice. Feb Mid-Module Feedback Questionnaire Feedback on your module experiences so far. It’s the perfect opportunity to get your voice heard. Apr Easter break Teaching finishes on Friday 12 April starts again on Monday 29 April Head home for a break, or take advantage of all the study facilities on campus to get yourself ready for exams and assignment deadlines. Summer ball It’s time to have some fun and celebrate all you’ve done in the past year. The SU summer ball has previously featured acrobats and dodgems, surfing and sky dancers, as well as live music acts and celebs. Keep an eye on hertfordshire.su for this year’s highlights!